Business Essentials can be purchased and installed just like every other plugin in the Community Store. You can also purchase the plugin through your Shopware backend in the Plugin Manager. You can find further information on the Plugin Manager here. The module itself can be found under “Basic settings > Business Essentials” in your Shopware backend. This is where you can approve requests, make basic configurations and define template variables. When the module is open, you will immediately see the window where you can manage all requests. 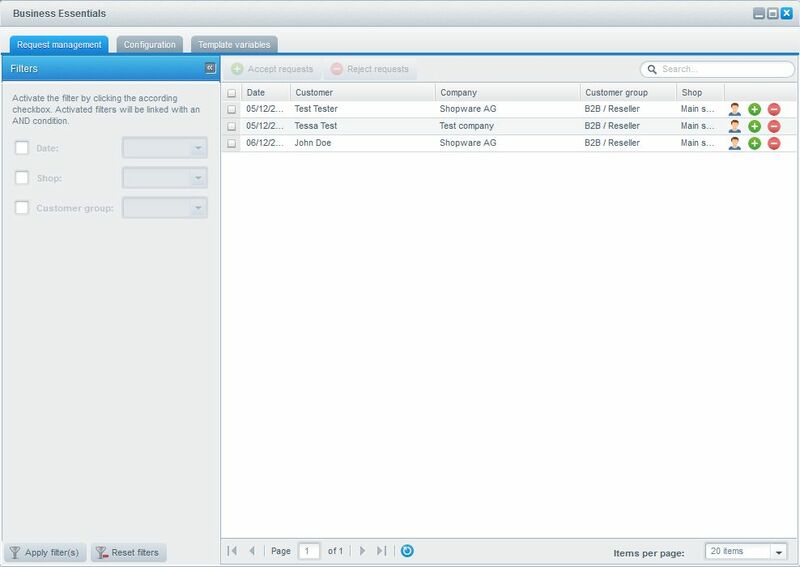 In the filter area located to the left of the window, you can filter the list of registrations by date, shop and customer group (for customers who have already been assigned to a group). Clicking on "Apply filters" will update the list, whereas "Reset filters" will deactivate the applied filters. 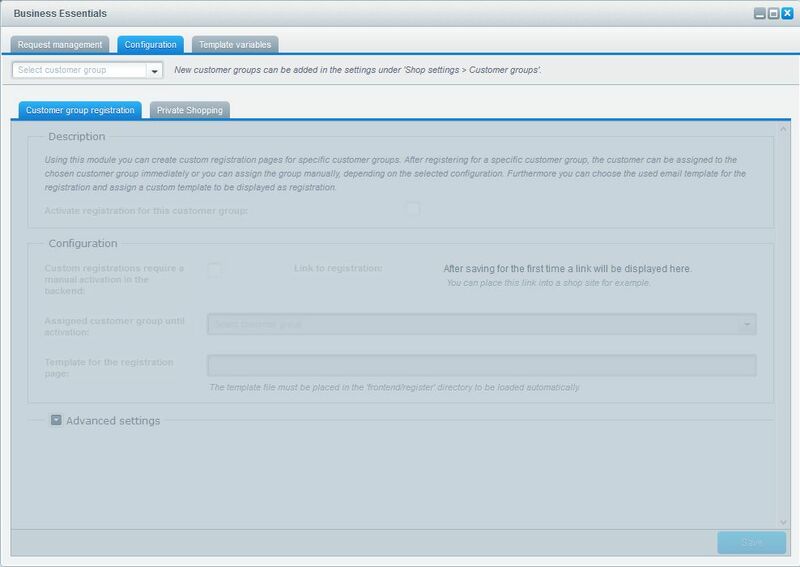 You can either activate or reject customers individually by clicking the "+" or "-" icons "or" in groups by selecting multiple entries at once and using the buttons located at the top of the window. The customer(s) then automatically receive a preconfigured email that notifies them if they have been accepted or rejected. 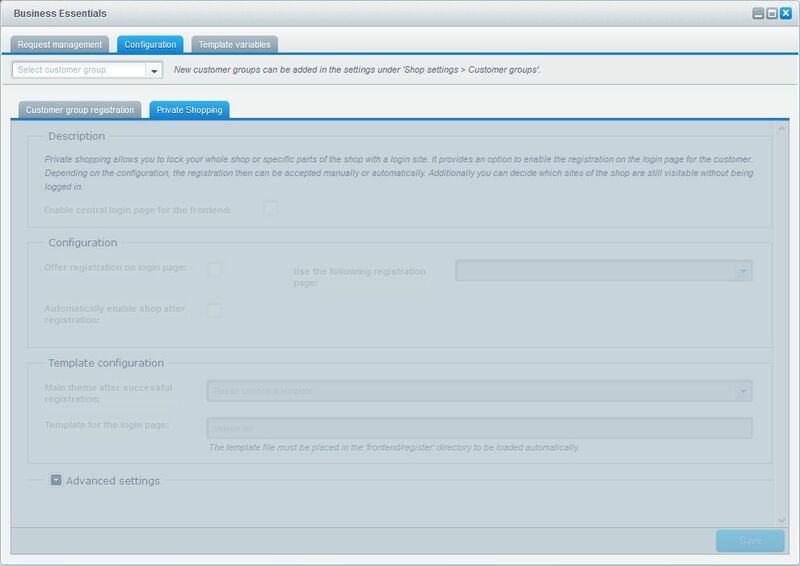 The following describes the configuration options available for your B2B shop. 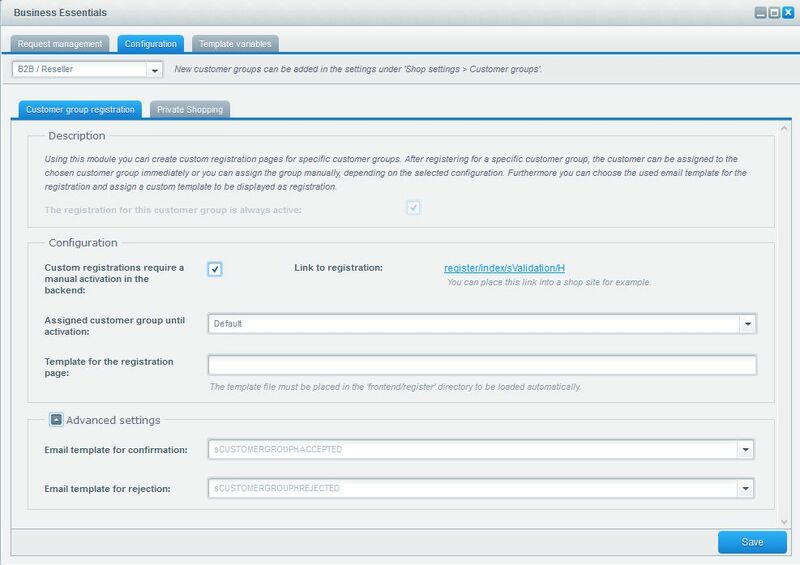 Under “Customer group registration”, you can find registrations for a specific customer group, which can appear different depending on the customer group and which customers have registered. Note: the information you provide here applies to the customer group for which your customer is registered (i.e. dealer customer group H). In order to define settings, you must first select a customer group from the dropdown menu at the top of the window. 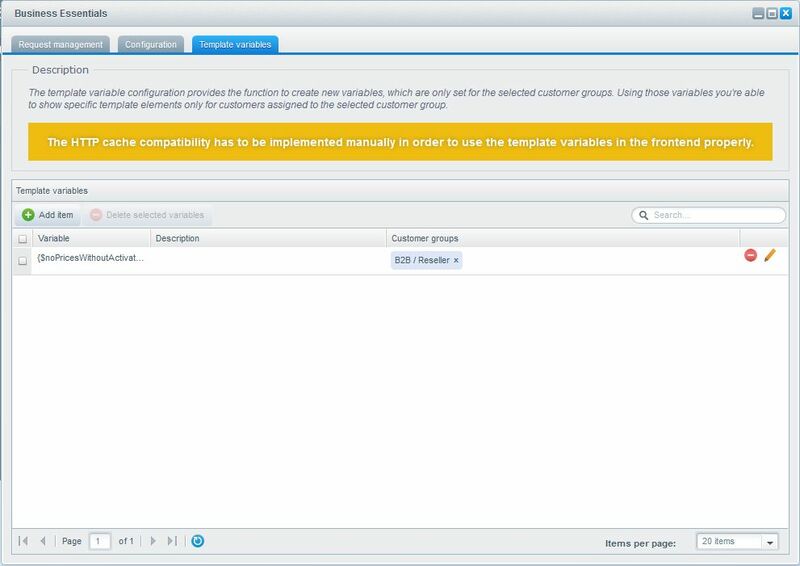 Custom registrations require a manual activation in the backend: When active, registrations for this customer group have to be approved manually. Link to registration: After saving your settings, an individual link will appear, which potential customers can use to register for this specific customer group. 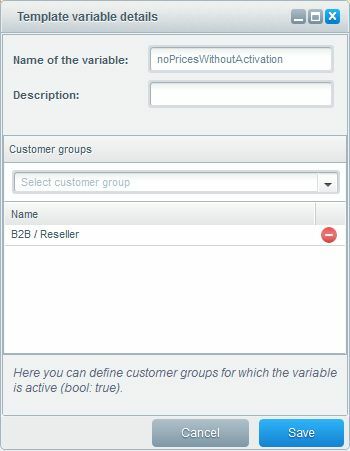 Assigned customer group until activation: Define the customer group that the customer is automatically assigned to until they are approved (or will remain if they are rejected). It’s important that you select a group that’s different from the group the customer is trying to register for. Template for the registration page: Here you have the option of creating an individual registration page. Just place your tpl file in your theme directory under “frontend/register” and name the file (i.e. pslogin.tpl). 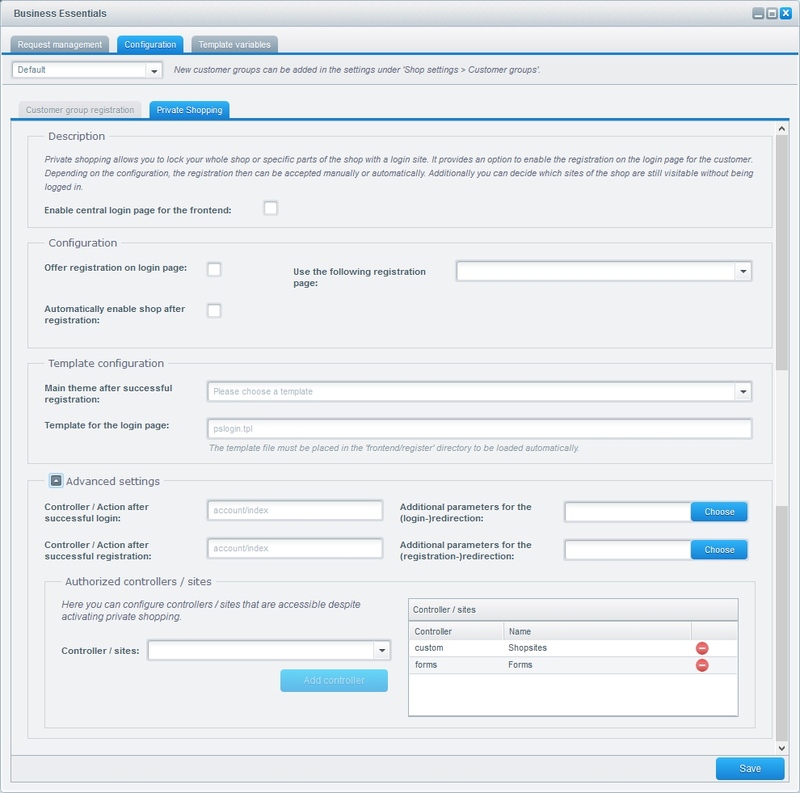 Note: This template file is only used when the customer group registration itself is called! A separate file is required for the private shopping splash page. Email template for confirmation: If this field is left empty, the default email template sCUSTOMERGROUPHACCEPTED is used. Email template for rejection: If this field is left empty, the default template sCUSTOMERGROUPHREJECTED is used. Screenshots are not used in this example because in this configuration, the standard registration / login is used and only the URL is different. After being approved, the customer is reassigned to the dedicated customer group. With Private Shopping, you can create a splash page that acts as a gatekeeper to your shop. Only customers who have been accepted and provided with login criteria are allowed to enter your shop. In order to change the settings, first select a customer group from the dropdown menu at the top of the window. Note: In general, these settings only make sense for standard customer groups, since customers of other customer groups have typically already been approved. Enable central login page for the frontend: This setting creates a central login page for the shop so that visitors cannot browse through your categories and products. Offer registration on login page: When active, visitors are able to register directly on the login page. Use the following registration page: Select the group the customer will be assigned to once they register. Depending on the configuration of the “customer group registration”, the customer will be granted immediate access or have to be manually approved before they can enter the shop. 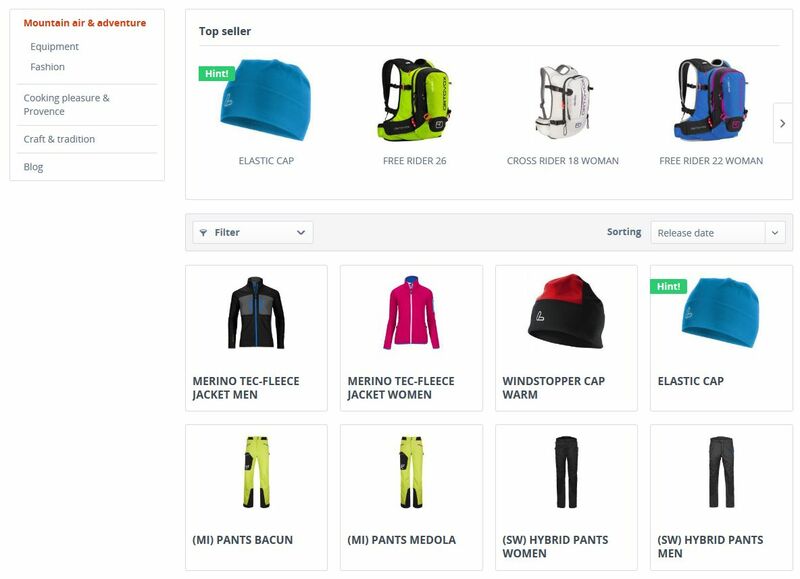 Automatically enable shop after registration: When activated, the customer can access the shop immediately after registering, regardless if they have been approved or not. Main theme after successful registration: Here you can define the theme that should be used after successful registration. If no theme is selected, the standard shop theme will be used. Template for the login page: In contrast to the registration page, here you can specify a template file that should be used for the splash page. Note: The splash page cannot use the same template file as the customer group registration page. Controller / Action after successful login: Here you can define the controller / action that should be called after logging in (i.e. account/index for the account). Controller / Action after successful registration: Here you can define the controller / action that should be called after registration (i.e. account/index for the account). 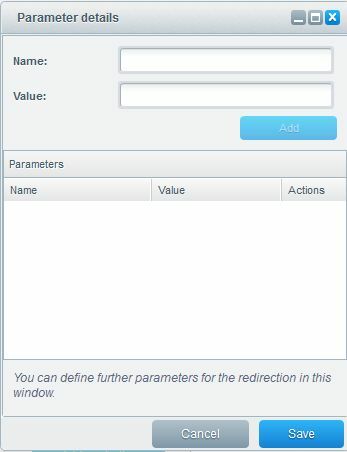 Additional parameters for the (login-)redirection: Here you can specify the URL parameters for the redirection after logging in. Click "Choose" and enter the parameter. Example: If you want to forward the customer to a specific category, enter listing/index and enter "sCategory" as the name and the category ID as the value. You can add more parameters, which the module automatically links with a "&". Additional parameters for the (register-)redirection: Here you can specify the URL parameters for the redirection after registration. Click "Choose" and enter the parameter. Example: If you want to forward the customer to a specific category, enter listing/index and enter "sCategory" as the name and the category ID as the value. You can add more parameters, which the module automatically links with a "&". Here you can define which controllers remain accessible on the splash page, which ensures that legal notice (shop sites) and contact form (forms) still function without the customer having to log in. By default, “Shop sites” and “Forms” are active. If you want to display the contact form you must add the site "Ticket/Support". Template variables can be used to simplify your work. Example: While you would like to manually approve your customers, you would also like to make it possible for them to enter the shop after registering, but without access to prices or purchasing functionalities. This is where template variables come to your aid: they can be used to blur out prices and particular functionalities prior to customer approval. You can now add all desired variables by clicking “Add item”. 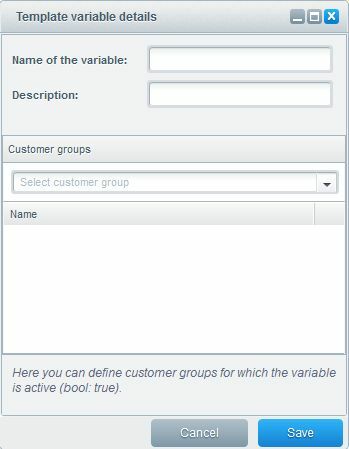 Enter the name here (which you can use to find the variable later), a description (if necessary) and define the customer group(s) for which the variable should be “true”. The variable is now available everywhere in your template and ready to be used. The following template adjustments are only examples – please do not make these changes unless you have the necessary knowledge on how to properly make template adjustments. These changes are not covered by support. Do not make any changes to the standard theme! Instead, always use a separate theme that derives from the standard theme. For more information on how to customize the template, please visit our Shopware Theme Guide. The examples are based on a separately developed theme. Further information on template adjustments can be found in our wiki Tutorial: Making changes in the template.